We would like to share with you an amazing opportunity: the Wilfried Martens Fund, which offers Thesis Prizes, as well as a scholarship for students from Armenia, Azerbaijan, Belarus, Georgia, Moldova, Ukraine, Albania, Bosnia and Herzegovina, the former Yugoslav Republic of Macedonia, Montenegro, Serbia and Kosovo. The scholarship allows students to pursue the Master of European Politics and Policies, and it covers tuition, monthly living expenses, Belgian health insurance, and Third Party Liability insurance. Applications are open for the 2019-2020 academic year. Please find more information here. As an EAPAA accredited one-year Advanced Masters Programme, MEPP is interested in attracting outstanding university students with a sound knowledge of the European Union and its institutions, plus who dispose of a profound fascination for policy making, management and administration on the EU-level as well as on the national level in a comparative perspective. For more information, have a look at our flyer at the bottom of this post. We were delighted to welcome the Secretary-General of the European Parliament, Mr. Klaus Welle, for an interesting lecture on European identity, its developments and the challenges it is facing today. The lecture was organised as part of a new course called 'Current Issues in European Politics, Policy and Government' where four to six conference panels are organised and practitioners talk about a current issue related to challenges to the European Union. Strasbourg is considered as one of the capitals of the European Union (alongside Brussels and Luxembourg) as it is the seat of i.a. the European Parliament and the Council of Europe. During a three-day trip organised for the MEPP- and MAES-students, those European institutions were visited. In the European Parliament, students had the opportunity to talk to the Belgian MEP Mr. Tom Vandenkendelaere. The last day was spent in Luxembourg, with a visit to the Court of Justice to have a talk with the President of the Court of Justice, Mr. Koen Lenaerts. You are a non-EU national and you would like to study at KU Leuven? Great! Apply for the Wilfried Martens Fund Scholarship to enroll in the Master of European Politics and Policies in September 2018. The deadline to apply is 1 March. For more information, please refer to www.kuleuven.be/wilfriedmartensfund. The EMPA consortium annually awards the Frank Delmartino Thesis Prize. The prize is awarded to the best thesis written by a student who went on an EMPA exchange. The winner of the Frank Delmartino Thesis Prize receives a sum of 500 euros and is invited to attend the upcoming EMPA meeting as to present the results of his/her thesis research. One of two winners for the 2016/17 academic year was MEPP Alumni Kilian De Saeger who went on an EMPA exchange to Sciences Po Paris. We congratulate him on his fantastic dissertation and wish him the best of luck in his future endeavours. We also congratulate Nora Wagner from Speyer University on her unique dissertation and wish her the best of luck in her future PhD-career. 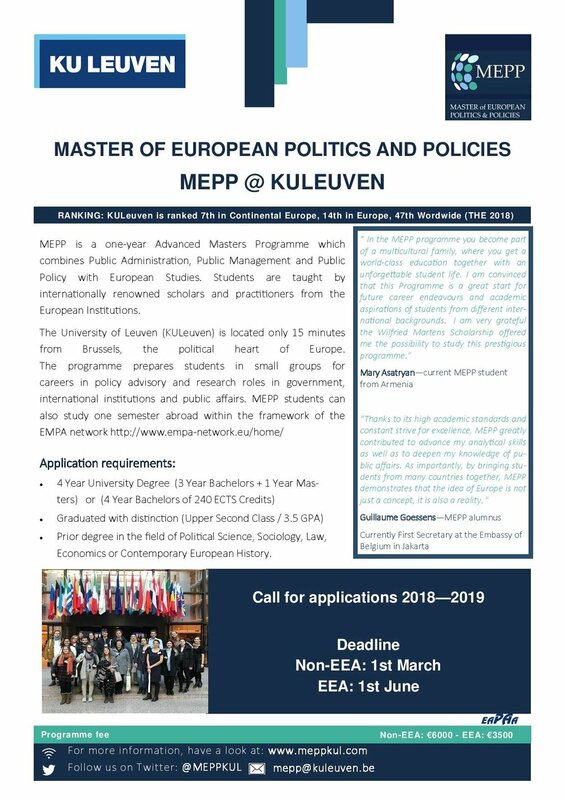 The Masters Programme in European Politics and Policies (MEPP) is inviting applications for the coming academic year, 2018-2019. On December 7th, we had our yearly, cosy Christmas Diner: the POTLUCK. All students brought along a traditional dish from their home country: either a starter, a main dish or a dessert. Our MEPP-students were represented at the 23rd UN Climate Change Conference in Bonn, Germany: Jacopo Tosoni from Italy and Miia Paananen from Finland. Quote: "As KU Leuven delegates to the COP23, we were able to see practitioners at work and collect unique data for our master's thesis. An extraordinary, amazing experience!"